End users in the packaging industry strive for high quality standards and compel their suppliers to meet these standards as well as their specifications. Compliance to quality standards is the critical attribute that end users look for in selecting a packaging products supplier. This is especially true among consumer goods manufacturers, where the product quality is monitored by the Government and any deviations from regulations may have significant negative ramifications. Packaging is a high-volume industry and demands high-speed production to cater to end-users’ needs. In such a high-speed, high-volume environment, solutions like enterprise resource planning (ERP) may not suffice. 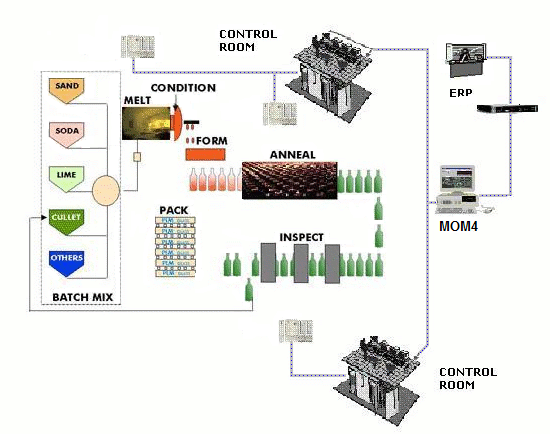 Manufacturers in the packaging industry need a complete and a modular MOM solution to optimize their production processes. The glass container production is challenging, each container must undergo rigorous checks. This means the producers lays great emphasis on automatic inspection and rejection equipment on the shop floor, which ensures that any issues are quickly identified and appropriate improvements made. The glass container manufacturing process involves a range of procedures, equipment, materials and team members. The key to maintaining optimum control of process quality and productivity is the elimination of any process variation. The NearSoft’s MOM4 solutions help the manufacturers to obtain this goal. In a global, cost-competitive manufacturing industry, packaging companies require enterprise-wide visibility to monitor and control their diverse worldwide manufacturing processes. They need a single, standardized solution that is easy to implement and will increase their return on investment. The case is even stronger for regional packaging solution providers, as the need to be globally competitive while effectively managing costs is instrumental to long-term success and sustainability. Packaging end-users also face difficulties in managing the information across different locations and at different levels. A Web enabled solution will allow them anytime, anywhere access and drive operational excellence while reducing performance variability.